Why should parents and teachers care about our over active little fruits and their shy letter friends? Because learning should be absorbing and entertaining for every child. We are designing learning materials that motivate, engage and support even the most hyperactive or difficult to reach children. 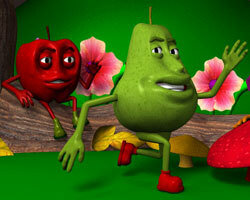 FruitPhonics offers a rich 3D animation based content and a flexible learning framework, including a powerful real time interactive platform. We believe this creatve application of technology to be the beginning of a new kind of phonics learning experience. FruitPhonics is an early learning platform designed to provide young learners with rich animated learning materials that are consistent with their experience of media products away from the formal learning environment. In addition, we aim to provide parents and teachers with a simple but effective set of tools to help them support children's learning. The project is multiplatform. This means that all of the content can be enjoyed as a video a PC, or video for portable devices, such as mobile phones and PDA's. In addition, we have developed an interactive 3D animation platform for both the web and client PC application that sets new standards for an interactive 3D graphics web experience. FruitPhonics believe that the creative application of technology means that we cannot just improve on new solutions to old problems. We can redefine the problem, rethinking the nature of the learning experience, its structure and purpose. In short, we can begin to redefine a childs phonics learning experience, targetting objectives that were previously merely aspirational. Children grow up in a world in which, due to technology, the nature and form of information is continuosly changing. They they absorb, an ever changing array of media forms; TV, computer, web and mobile devices are merging into a continuum of information platforms and delivery channels. As active nodes in one, or several, of the proliferating set of social networks, children have become active creators and participants, consuming on demand. Afinity and control is the reality of the post games generation. Education cannot exclude itself from these trends. If the learning process does not stimulate, or the materials fails to resonate, do not hope for absorption and progression. Old forms of media are becoming an alien voice, explored with limited functionality and devoid of the hooks of relevance. FruitPhonics is a flexible, energetic and entertaining set of interactive phonics learning materials designed to attract, motivate and immerse children in a world of rythm and rhyme. Through our carefully designed characters, we make language a thing of laughter and excitement. Through technology we will offer flexible delivery to meet the needs of modern children, whether in school or at home, and the tools with which to explore and engage with and even reuse the core learning materials. Of course, this website is only a first step. To complete the project we will require a great deal of help; your help. As parents and educators, you can help us to begin producing the kind of educational content and tools neccssary to meet the needs of several generations of children to come. Great design can be an adventure, learning can be fun and with the right tools, literacy, the basic survival tool for the modern world, can open to all children.